Zambia’s biggest B2B Agricultural event of the year, the 2nd Agritech Expo, opened its gates to farmers on the 16th April 2015 and ran for three days until the 18th April. This year’s Expo comprised of an SME Zone, Sprayers Arena, Irrigation Zone, Crop Trials, Livestock Zone, Indoor Expo & Demonstration Fields. Amiran were amongst the 112 international exhibitors to have taken part in showcasing the latest farming techniques and developments. We had a live-demo crop plot spread over 1600 m² on which we erected a Solarig greenhouse, displayed Netafim drip irrigation, micro-jet irrigation and sprinklers, all connected to a full water tank providing live demonstrations. Amiran also supplies Fertigation tanks which were on display and mini-workshops were conducted around their benefits. In the pivot irrigation zone, Amiran partnered with Lindsay Africa to showcase the Zimmatic pivot spans on an exhibition space of 400 m². Our greenhouse was the venue for our new product launch on Friday 17th April, namely the Amiran Open Field Kit. The event was attended by the Minister of Agriculture Hon. Given Lubinda & his deputy Hon. Maxas Bwaupe. Amiran Managing Director, Mr. Yosi Karni, gave a welcoming speech in which he emphasized that by launching this new Kit we are staying true to our reputation as pioneers of modern farming technology in Zambia. Amiran recognizes that as a company we stand before the challenge of changing mindsets towards farming, especially among the Youth. The tool with which we will embark on tackling this challenge is a colorful advocacy campaign running under the slogan of “FARMING IS COOL”. CEO of Balton CP group described how as part of the company’s evolvement, Amiran Zambia have recently rebranded, creating a brand new look for the company in Zambia and indeed, as part of a movement throughout Africa – as members of the Balton CP group. This rebrand will carry a sense of renewal throughout the company and in turn, through the agricultural sector. The Hon. Minister of Agriculture Mr. Given Lubinda was our Guest of Honor and delivered a speech on Youth and their role in the future of farming in Zambia. He commented how wonderful it is to see this new initiative by a veteran Zambian company and to see how they will be able to empower small-scale farmers to build sustainable and profitable year-round businesses, to increase their farm yields and thereby improve their quality of life. He said that Amiran Open Field Kits are job creation tools and will empower small-scale farmers by presenting them a business model which will make them self-reliant – starting with the youth who are the next generation of farmers. These Kits will be benefitting two levels of entrepreneurs: Firstly, the small to medium scale farmers and secondly, the local Agri-input Distributors, opening a chain of supply which will also involve rural distributors. To end the programme, we had a young farmer (aged 29) named Mr. Soko who started farming at a very young age and gradually built up his business with the help of Amiran’s know-how, hybrid tomato varieties & drip irrigation. He shared his testimony with the guests and the gathered crowd and received a standing ovation for his great achievement. The Minister was so impressed that he autographed Mr. Soko’s hat! The event was attended by our guests – NGO representatives, the media and farmers. We had approximately 300 bystanders looking on, and crowding around the greenhouse in an effort to hear all the speeches. On 18th April His Excellency President Lungu attended the Expo and visited the Amiran stand. He was accompanied by Minister of Agriculture Hon. Minister Given Lubinda and the Head of Zambian National Farmers Union (ZNFU), Dr. Evelyn Nguleka. We presented President Lungu with written material about Farming Is Cool & very briefly shared our vision for the Youth of Zambia. 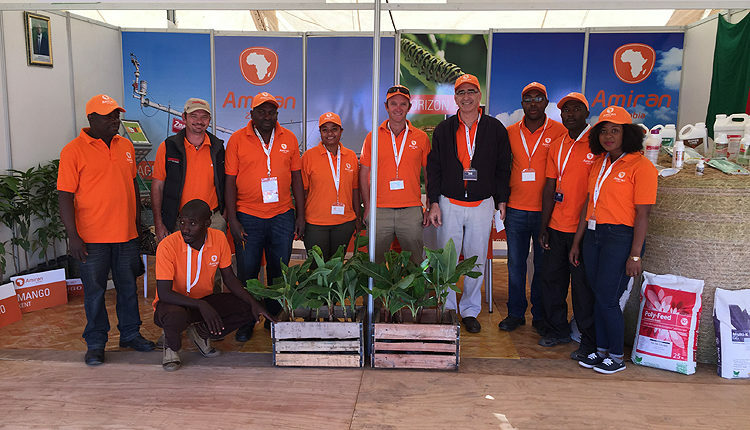 Overall the Agritech Expo 2015 was a very successful show for Amiran and really brought much attention to Amiran’s new brand and strengthened our ties with the international brands we represent in Zambia. We were able to network a lot particularly with NGOs and small-scale or up-and-coming farmers. We also received a lot of media coverage.